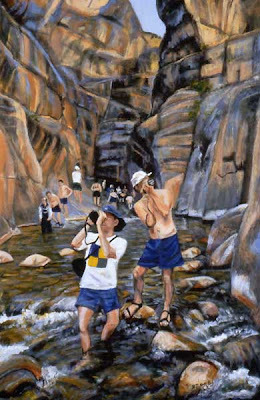 This is a painting from a series of snapshots I took while on a wonderful river trip, rafting down the Grand Canyon. The two guys here are my brother-in-law and my nephew. Yes, I took a few photos. My husband, Jim, took hundreds and hundreds of photos. This made sense because he's a professional photographer and consequently, was working. Jack and David were on vacation, but they took pictures non-stop on this trip. I'm not sure if they ever saw the Canyon except through the viewfinders on their cameras. It made me think about what the trip would have been like for them with no camera at all. It certainly would have been a different experience. Maybe we should all leave the picture-making to the professional photographers, use our vacations to enjoy our surroundings and purchase that quintessential image which really captures the place from the guy who makes his living doing this! For a look at Jim's wonderful current project which is chock full of photos and other exciting stuff, look at the US Route 89 project!